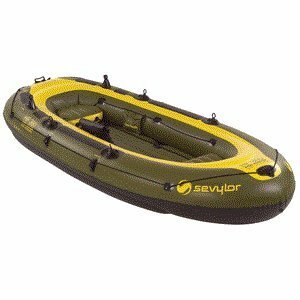 The Sevylor Fish Hunter Inflatable Boat is packed with features for performance and convenience, so you can focus on fishing. Measuring 11 Feet9 Inch long by 5 Feet7 Inch wide, the 6-Person Fish hunter holds up to 1,200 pounds and is durably constructed of heavy-duty 32-gauge PVC. The Fish Hunter is built with two tunnel chambers for lateral stability on the water. For comfort, the Fish Hunter features two inflatable seats, two fishing-rod holders, four swivel oarlocks, and chafing pads. Drain plugs make it easy to empty out water, while an all-around grabline and built-in carry handles offer convenience. The Fish Hunter includes bow and stern fittings for an electric motor, with optional fittings for a 2.5HP motor. A handy gear bag and battery pouch are included. Guaranteed not to leak, thanks to Sevylor Feets exclusive Airtight System, the boat Feets Double-Lock Valves prevent accidental air loss and ensure quick, easy inflation and deflation. NMMA certified.